A few months ago I decided to diversify my bookshelf and read only women of color for the rest of the year. That decision perfectly coincided with the release of Nafissa Thompson-Spires short story collection, Heads of the Colored People. The book opens with a bang--a shooting--and on a note of anger that courses throughout every story. And close behind this anger, humor abounds, often dark and grim. This is a book I found myself picking up at any moment I had free in the day, rereading segments that were packed with grief but also left me laughing aloud to myself. The book captures a black experience that holds itself up throughout as definitely black, just not the only black, and it is in these ways this book shines. 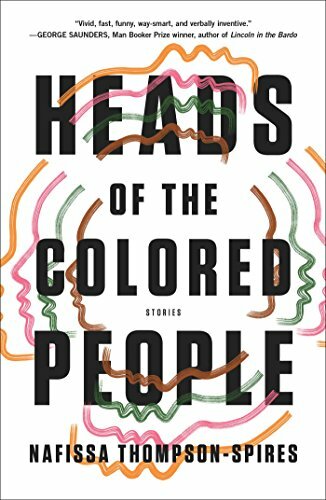 Heads of the Colored People is a collection of 12 short stories centered around successful middle class black people, most taking place in environments where they are the only, or one of the only black people around. What I love about the stories is that they are mostly about an internal struggle of how these individuals choose to represent themselves in different situations. In one story a professor is forced to contend with an office mate he doesn't particularly get along with over how each one likes the light in their shared office which manifests itself in a series of escalating microagressions. In another, one of my favorites in the collection, two mothers get into an argument with each other through notes they pass between themselves in the backpacks of their daughters. In both stories the presence of the black self against a predominantly white backdrop is present, the professor a black man at an HBCU where his colleagues are mostly white women, or the mothers of the only two black girls at a prestigous private schools. The mothers are careful with how they present themselves and their daughters for the other. Though it isn't expict it's apparent in their initial letters which include full titles and degrees to show status, or when insults like being too "black skinded" start being thrown about. What I love about these stories however is that they all stay present with the characters, characters whose stories often don't get told. Everyone else often feels like a giant undefined other, just a group of people that the main characters are aware of, have to interact with, but aren't always well defined. Another story has a young black girl juggle through different options for suicide while constantly checking her social media accounts to see how people are reacting to the subtle clues she's dropping, people who can't actually interact with her or fully understand her intentions. There are allusions to artistic and actual depictions of death and suicide as the book opens with the protagonist, Jilly, taking her head out of the oven doing her best Sylvia Plath imitation. While thinking through her options and the ways people thought about and talked about other deaths she wondered about the ways in which people would talk about her own death and ultimately settled on "when black women died it wasn't glamorous...black women's bodies just died, out of frame." So much of this book revolves around a palpable grief that to me, is centered in this feeling that these stories, mundane and just regular, often go ignored but represent real battles that so many people face. And this is another place where this book shines, so much of the conflict, often serious, takes place in situations that are mundane, that we all find ourselves in at some point or another; the man at Wal-mart buying a sleeping bag for his daughter, the woman doing her best to keep it together while at the DMV, a woman with a million preoccupations doing yoga present in everything except what she's doing. It adds a level of universality to stories that are in no way universal nor does it ever claim to be. Even the characters that appear in multiple stories are fleshed out in ways that can make it feel like you're reading about brand new people, and based on the ordering of the stories, I think it is a very intentional disorienting, one that forces us to consider these characters individually each time they are present. Nafissa Thompson-Spires has added a very interesting new voice to the literary world and I can't recommend this book more to everyone. Each page is full of surprises both fun and sad. The stories are unique and inventive, even injecting her own voice at the end of the first story, adding a note that almost feels defeatist, but also shows the necessity of this story and, to me, is begging for me. "And what is a black network narrative but the story of one degree of separation, of sketching the same pain over and over, wading through so much flesh trying to draw new conclusions, knowing that wishing would not make them so?" Go read this book. Brian is a writer and a photographer. He has a BA in Comparative Literature from CUNY Queens College and has spent the past several years working on the fringes of the film industry. He lives with his cat in Queens.